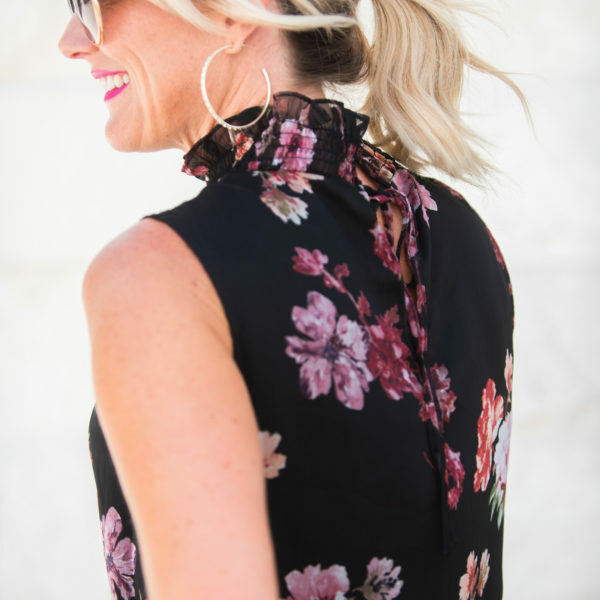 Holiday Style | Gibson x Glam Collection | hi Sugarplum! Have I got some exciting news for you!! Holiday season is around the corner, and it’s going to be a stylish and festive one thanks to my friends at Gibson! You may remember them from the Gibson x Hi Sugarplum Collection we launched earlier this year?! 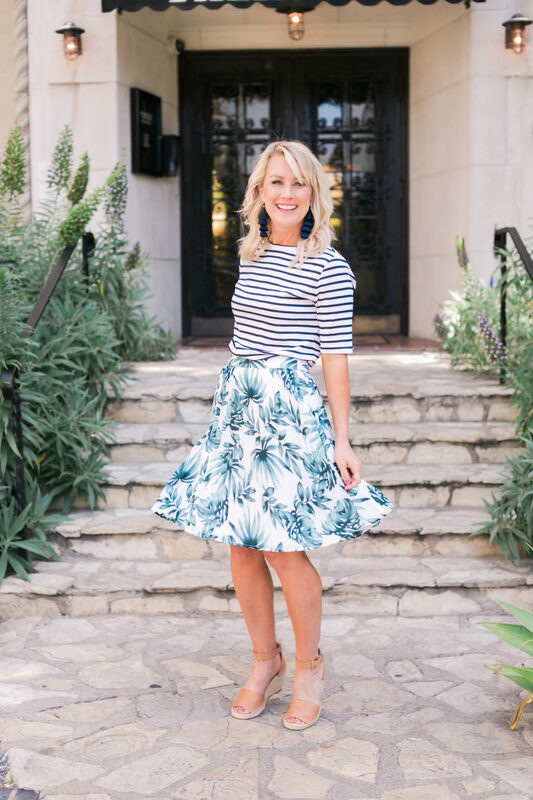 Working with the brand and founder, Suzie Turner, has been the biggest blessing and surprise of my blogging journey. 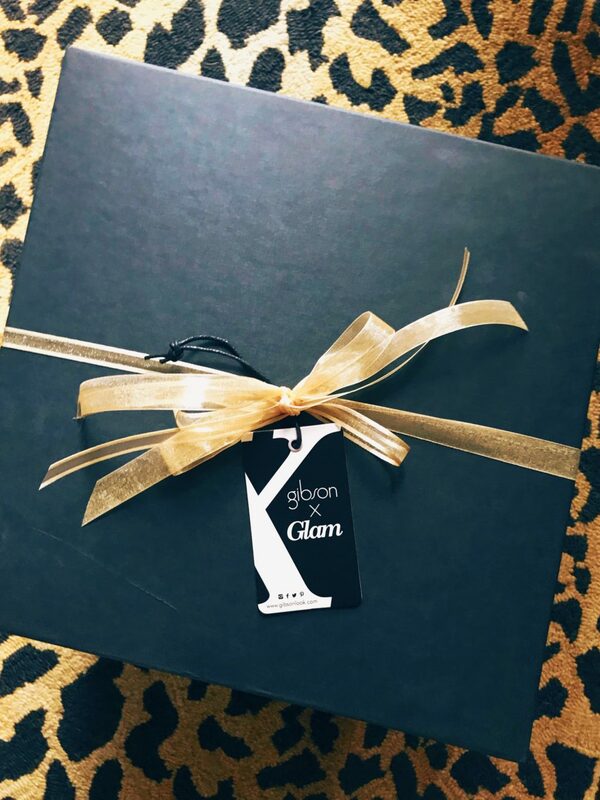 Their team of talented designers and fit experts continue to amaze me with their creations, and you’re going to love the new Gibson x Glam Collection! So what is Gibson x Glam? A collection of gorgeous pieces designed specifically for holiday (and beyond)! Think gorgeous lace, luxurious velvet, and stunning sequins, all in the most beautiful, rich colors of the season. 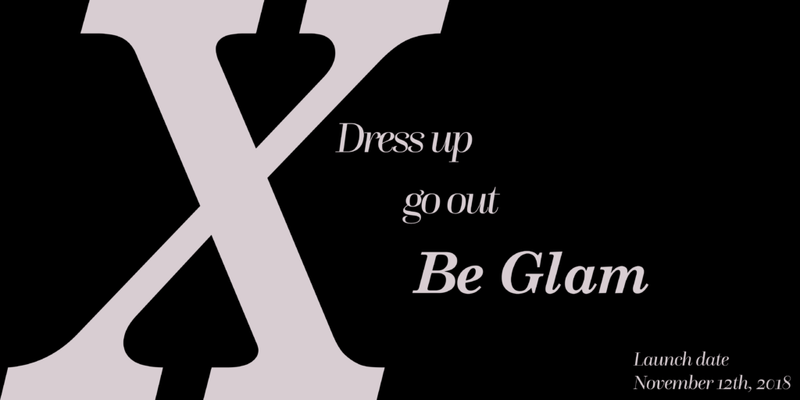 But even better, everything is completely wearable year-round for all your special nights out. 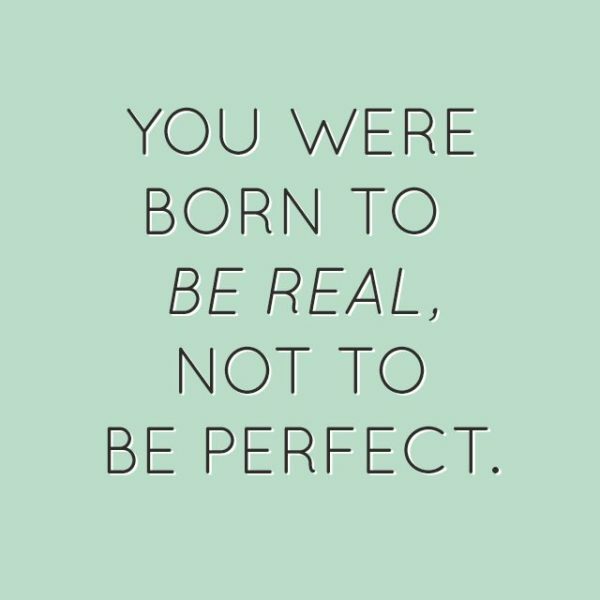 And nothing is so fancy you can’t pair it with your favorite jeans and heels. 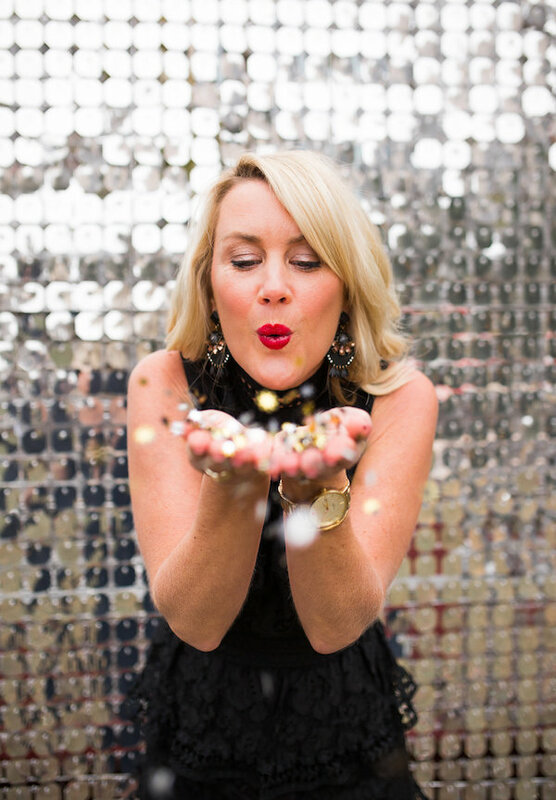 Girls night out, neighborhood holiday party, office after-hours gathering…they’ve got you covered! When and where is Gibson x Glam available? Is this another Gibson x Hi Sugarplum Collection? So how are you part of this Gibson x Glam? 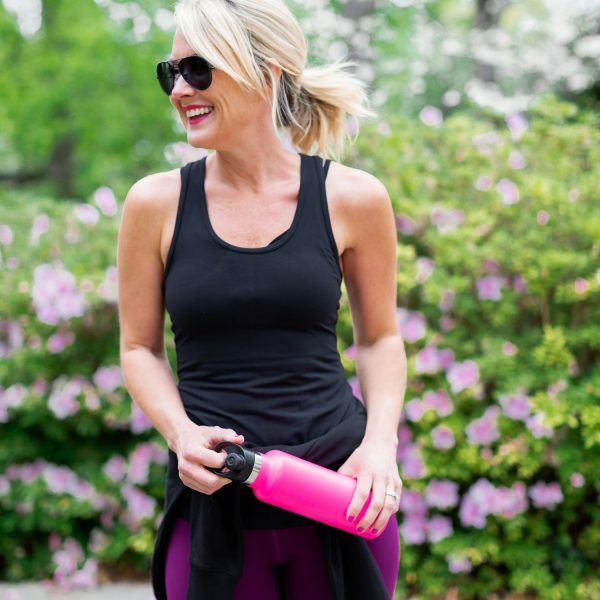 I’m actually one of nine bloggers Gibson assembled to help collaborate on this exciting, first-of-its-kind project! Gibson designed several pieces with each of us, and our readers, in mind. Together we chose the ones we loved most and weighed in on design details and fit. 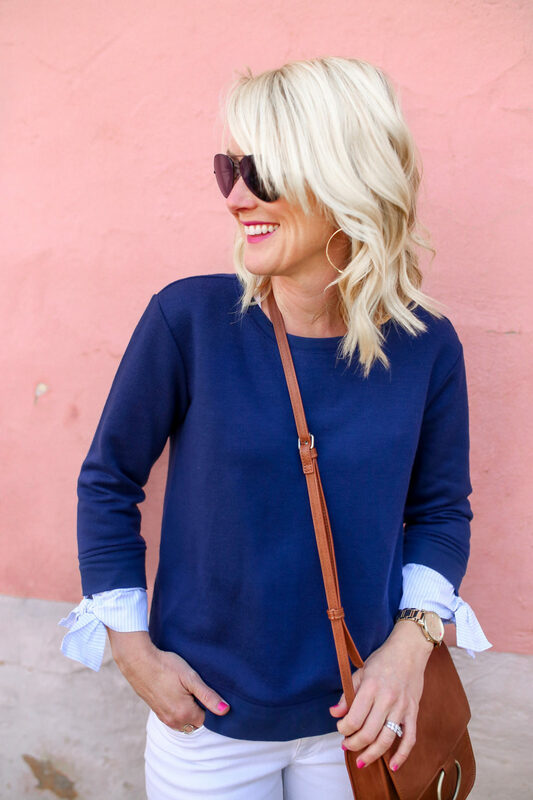 So come November 12, you’ll be able to wear ‘The Cassie’ top to all your holiday events!! So exciting, right?! Who are the other bloggers involved? 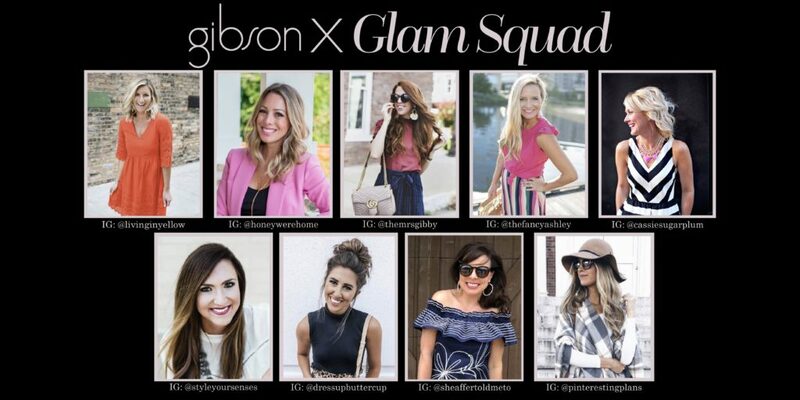 The Gibson Glam Squad is an amazing group of talented, kind, and supportive women whose passions are sharing great style and joy. Some are my real-life friends, and others I’ve been following for years and can’t wait to finally meet in person. They are the true meaning of community over competition, and I couldn’t be more honored to be included among them! We even have a private appointment at the cool new Nordstrom Local on Melrose, where we’ll experience their service and personal styling first hand. Be sure to follow along in Instagram Stories for all the fun! Of course I’ve packed up some of my favorite Gibson pieces! I’m wearing this new v-neck pullover on the plane, and couldn’t be more comfy! 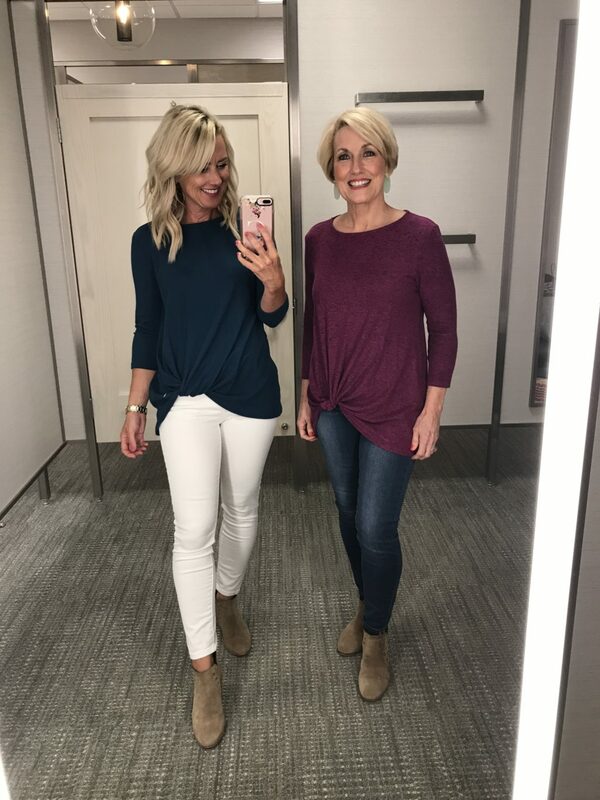 It’s such a great fit and so many pretty colors to choose from! I hope you’re as excited for this fun collection as I am!! Without a doubt, there’s no way I’d have this opportunity without YOU!! Your enthusiastic support and loyalty to me and this blog does not go unnoticed, and is appreciated more than you know. I hope you find as much joy and inspiration here as you bring to my life! 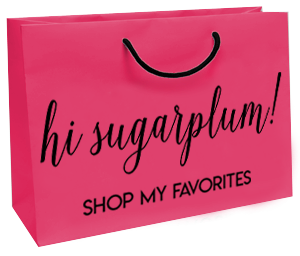 Stay tuned for more details, and the full reveal on Hi Sugarplum November 12! Who’s Doing it All? Not Me! Ahh! So exciting!! You SO deserve this, Cassie! 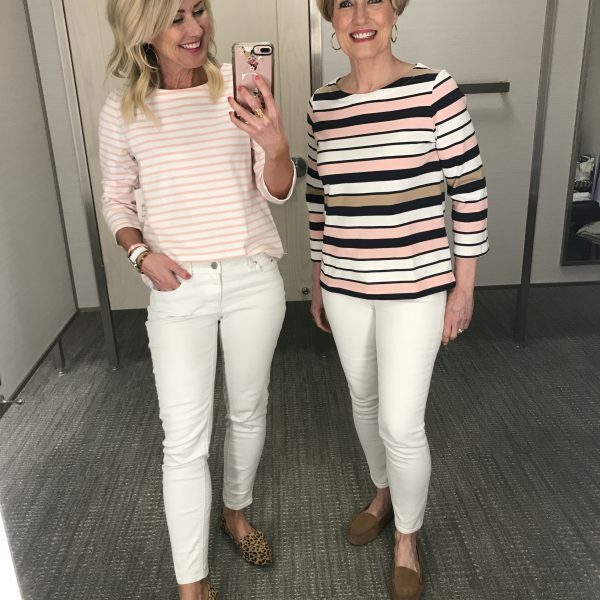 I love getting fashion advice from your blog! Your posts are thorough and never leave me with more questions to ask. Have the best time! Oh my gosh, thanks so much, Beth! I’m thrilled you find inspiration here!! Thank you so much!! 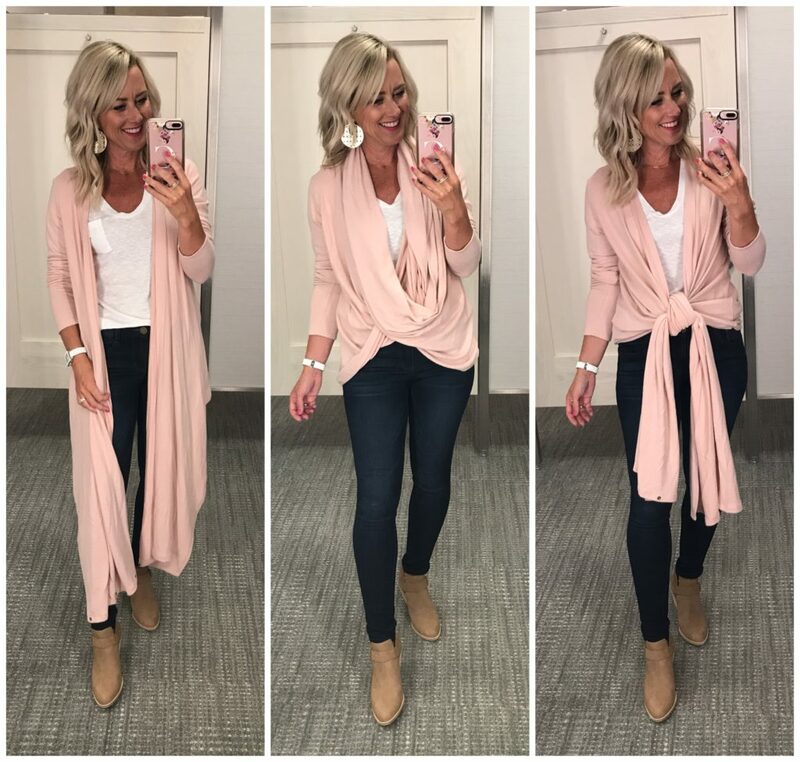 And I hope you love that cardi! I thought something was afoot for holiday! 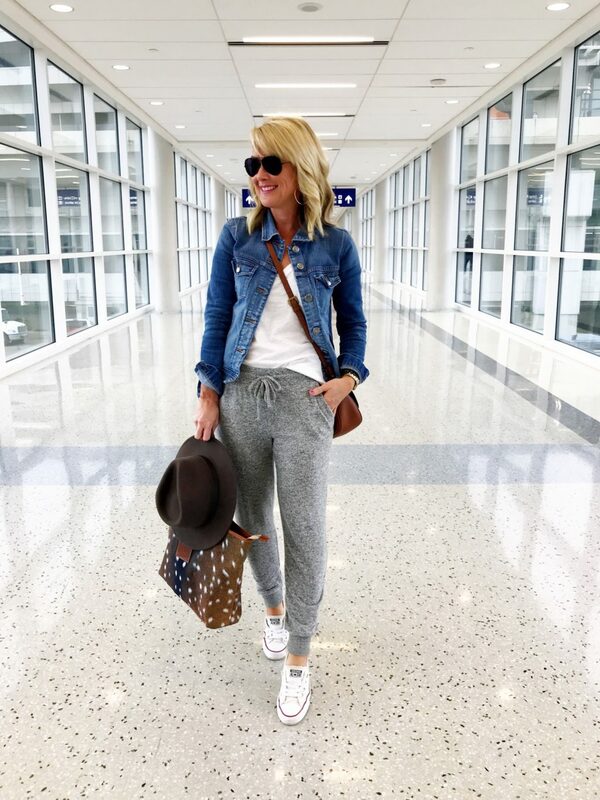 You make a perfect partner as you excel at both casual styles and playing “dress up”. Looking forward to the launch. Will you also be taking us behind the scenes at the photo shoot? Sounds like so much fun! It’s exciting that you will be trying on the collection with all the other bloggers. Have fun on your trip! Thanks so much, Julie!! I’m excited to share it all with you guys! Congratulations, Cassie. I am excited for you, but the one thing that stands out is the complete and total lack of diversity of bloggers chosen. I would have loved to have seen some plus size women and some women of color represented. So happy for this adventure for you… and somehow I know I will see this collection on Mama Sugarplum which I always love! Have fun!! So exciting! My birthday too!